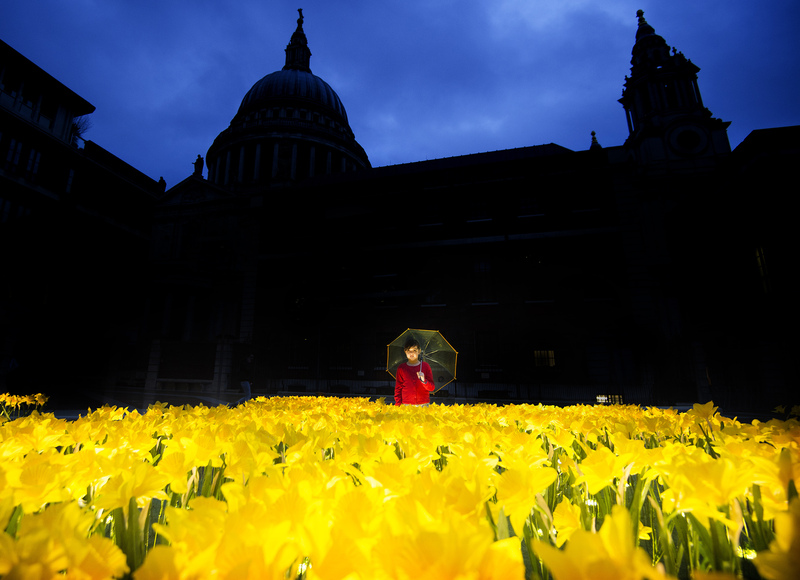 Garden of Light Springs up to Launch Marie Curie’s Great Daffodil Appeal A Garden of Light made up of 2,100 beautiful handmade daffodils will be springing up overnight in the shadows of St Paul’s Cathedral in the city. The outdoor installation created by renowned public artists Greyworld marks the launch of Marie Curie’s Great Daffodil Appeal. The 2,100 daffodils represent each one of the Marie Curie Nurses working across the UK who provide care and support to people living with a terminal illness. The daffodils will light up at night, symbolising the light Marie Curie Nurses bring to people in their darkest hours. PIC: Imogen (12) daughter of a Marie Curie Nurse looks at the installation.